The garden, a great place for the munchies! These cabbage patch “kids” love to call your garden home. Find the adorable chart Here! A glorious flower for each month of the year. Beginning with the January Carnation and ending with December’s Poinsettia. The vibrant colors will “pop” off the fabric. Find the chart Here! 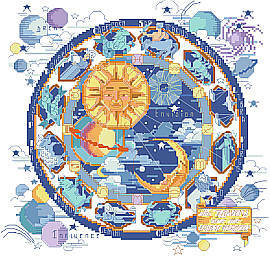 Astrology, Zodiac, Celestial signs are all the rage, so this sampler is right on trend! Find the chart Here! With fabulous exotic design and stunning contrasting shades, this classic Persian tapestry is perfect for bohemian room décor. This piece will make a bold statement in any room; find the chart Here! Bird-of-Paradise and Hibiscus! Petals of absolute perfection in wispy shades of pastel color. Add to that, the stunning Orchids that bedeck this outstanding design. The center diamond of orchids is worked over one thread to capture every nuance of the delicate petals. A stitched, beaded fringe adds a finishing touch to this elegant piece. Find the chart Here! 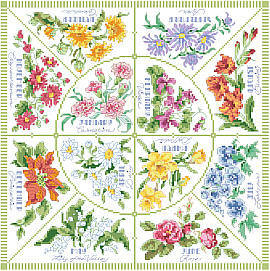 A beautiful Beehive motif graces this sampler from Sandy Orton.”Life is the flower of which love is the honey.” This rich and colorful design has lots to offer the experienced stitcher. 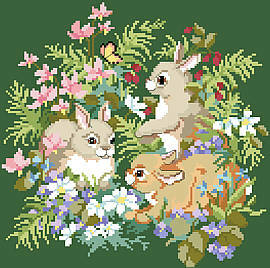 It has a variety of stitches, stitches over one thread and forget-me-nots, carnations, and bees everywhere. Find the chart Here! This is our take on the classic Americana band sampler in a style more sophisticated than primitive. This subtle design by Deanna Hall West has soft tones of gold, green and teal which will fit into today’s décor. 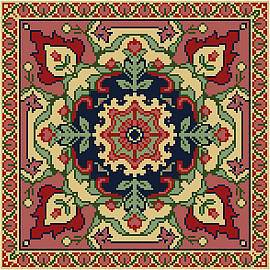 A full 18 ¼” long on 14 count fabric when finished. Find the chart Here! 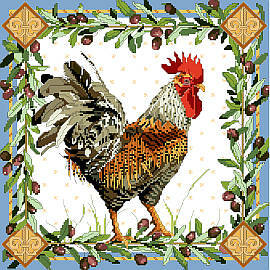 This intricate rooster design by Nancy Rossi blends intricate patterns of flora and fauna into an exquisite artwork that can be applied in many ways. A fetching companion to our Hen design. Find the chart Here! Spring is in the Air! A mesmerizing marvel after the harsh, cold New England winters. Behold the welcoming sight of buds and apple blossoms as they cover the trees. No season is as welcoming as Spring. Find the chart Here! Today is my daughter’s birthday, so what better way to celebrate than to share this beautiful February Birthday design with you all? Everyone needs a Fairy in their life. This one is just right for February birthdays because she’s wearing the color of the birthstone, purple Amethyst, holding a heart and has flowers in her hand. A lovely design for anyone born in February. One in a series of twelve faeries. 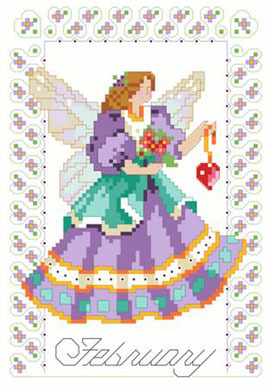 Each PDF download comes with a full color image, chart, DMC floss color guide, general instructions and stitch guide. find the chart Here! Search Our Catalog | Kit Store | Chart Store | Book Store | Free Projects Copyright © 1984-2011 Kooler Design Studio Inc. All designs, images and information on this site are copyrighted and may not be reproduced or redistributed in any form without the express written permission of Kooler Design Studio or their respective owners. "Kooler Design Studio" and the Kooler Design Studio Logo are Trademarks of Kooler Design Studio, Inc.